The Springfield and Central Illinois African American History Museum features exhibits which tell authentic stories about African American life in Central Illinois past and present. Special events and private guided tours can be made outside of general admission times. Please call the office to schedule your event, (217) 391-6323, Toll Free (877) 757-2247. In celebration of national women’s history month the Springfield and Central Illinois African American History Museum is proud to announce the opening of our latest exhibit: “African Women on U.S. Postage Stamps”. This exhibit features “The Door of No Return”, a special interactive audio-visual experience, designed by Jim Betts, an instructor at LLCC and retired Scenic Department Head at Paramount Studios. Included in the exhibit are figures designed by Alice Boykin, narratives on the history of slavery and the Middle Passage, as well as an artistic presentation of Mother Africa by Korbin “Kas” King. The exhibit is sponsored by the Rotary Club of Springfield South, the Springfield Area Arts Council, ALPLM, and LLCC. February 9th at 10:00 a.m., program at 5:30 p.m.
Presidential artifacts, speech excerpts, letters, campaign paraphernalia, photographs; examples of everything Obama. The Springfield & Central Illinois African American History Museum (AAHM) will host the grand opening of its President Obama exhibit on February 9, 2019. The exhibit will be open for viewing beginning at 10 am and the program begins at 5:30 p.m.
On January 20, 2009, Barack Obama was sworn in as the first African American President in US history. He began his political career in the Illinois legislature, then a US Senator from Illinois, and launched his successful campaign for the presidency on the steps of the Old State Capitol in Springfield. Nia Odeoti-Hassan and Beverly Helm-Renfrow worked with then Congressman Obama in the Illinois Legislature. They will speak to that experience. 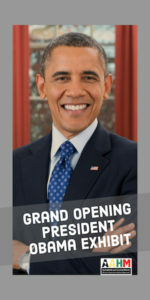 Others will speak to “Reflections on President Obama” and a portion of one of his most famous speeches will be played. The African American History Museum of Springfield and Central Illinois salutes and honors King's legacy through a commemoration of his life, with a focus on the influences of his life, his profound writings and speeches. Doris Bailey, the coordinator of the Springfield and Central Illinois African American History Museum, was interviewed by Rachel Otwell of NPR Illinois on April 4, 2018, the 50th anniversary of the assassination of Martin Luther King Jr. Click on the link below to hear this very informative interview, which includes a brief audio tour of our Martin Luther King exhibit. This dazzling exhibit of object-enhanced oil paintings are dynamic and thought provoking. Artist Preston Jackson is more often recognized for his monumental outdoor sculpture such as the "Acts of Intolerance" located in Springfield's Union Square Park or "From the Cottonfield to the Battlefield" in Decatur. These paintings depict social interaction and encourage us to contemplate our own means of communicating. 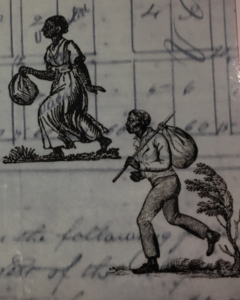 This exhibit explores and illuminates African American families who moved to Central Illinois in the 1800's and who have descendants in Springfield. 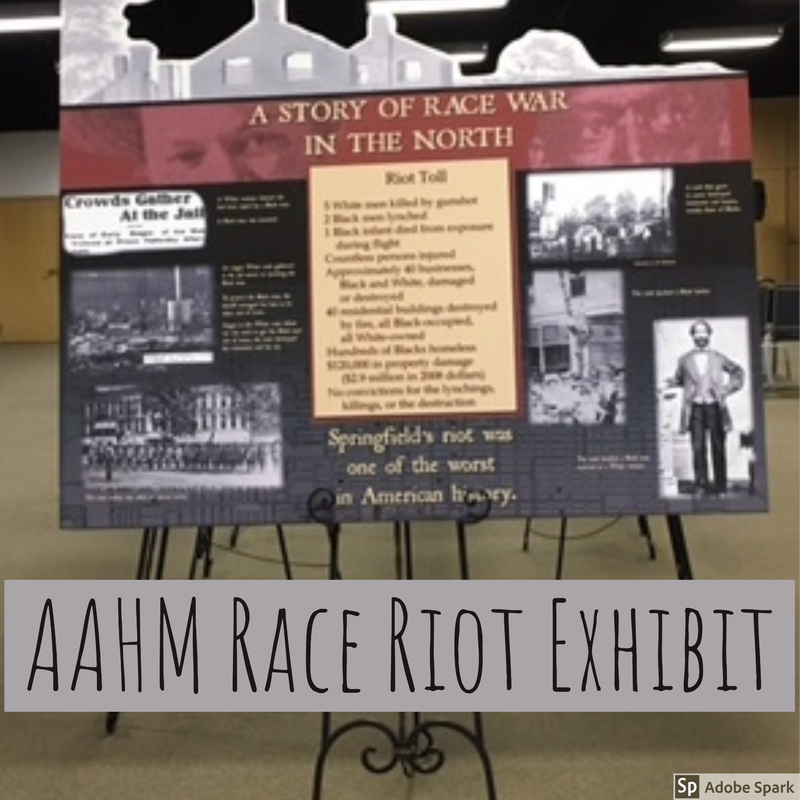 The exhibit is the result of research and interviews done by board member, Elizabeth Alexander and volunteer, Patricia Davis. It was sponsored and funded by a grant from the Sangamon County Historical Society. No charge, but donations are welcome. The Journey to Freedom traces slavery in North America starting in 1600s, escalating to eventually encompass almost 4 million slaves in the United States alone prior to their emancipation. The exhibit describes how African Americans served the Union cause during the Civil War. The enlistees were assigned to segregated "Colored Troops". The contributions of many African American Ablolitionists including Fredrick Douglass, Sojourner Truth, and Harriet Tubman are described. This exhibit was developed by Robert Davis who also portrays Fredrick Douglass. On the evening of August 14th, 1908, a race war broke out in Springfield, Illinois. Although six people were killed, thousands were terrorized, and hundreds of African Americans left Springfield, the event was almost lost to history. After the flurry of (biased) news coverage directly following the event, there was little said or written about it for nearly 80 years. Springfield has seemed reluctant to come to terms with its past. Slowly, efforts led by residents to hold the city accountable for the events of the riots have led to some successes, although many of its citizens remain oblivious to this facet of Springfield’s past. The riots led directly to the formation of the NAACP, and should be studied so that we can understand the mistakes of the past and look forward to a more peaceful future. Panels are provided by the Abraham Lincoln Presidential Museum. This exhibit of stunning black and white photographs by Eddie Winfred Helm (1911-1994), fondly known as "Doc" Helm, covers a broad range of people and places. During 50 years as the Secretary of State's photographer, Helm captured on film momentous events and occasions. During that time, he also photographed a multitude of everyday events, people and places. In this collection are political and sports figures, doctor's offices, lunch counters, nigh clubs, farm scenes a more. We challenge you to identify some of the individuals pictured. Helm's daughter, Beverly Jean Renfro, is generously loaning these photographs to the Museum. The elite cadre of US Marshals was once the domain of white men only. In 1875 Bass Reeves was the first black man appointed a US Marshal and in 1877 President Lincoln appointed Fredrick Douglass a US Marshal. It was 85 years until the next African-American received an appointment. Robert Moore was appointed by President Bill Clinton on October 17, 1994 and served until his retirement on June 29, 2002. This exhibit is curated by US Marshal Robert Moore and contains many items from his personal collection. The "History Maker Banners" honor prominent Illinois African Americans. Visit the exhibit to learn of the significant contributions made by these exemplary individuals. A timeless look at Midwestern quilts, their purpose and evolution. Early Sangamon County quilts made entirely by hand are displayed side-by-side with today's machine techniques.